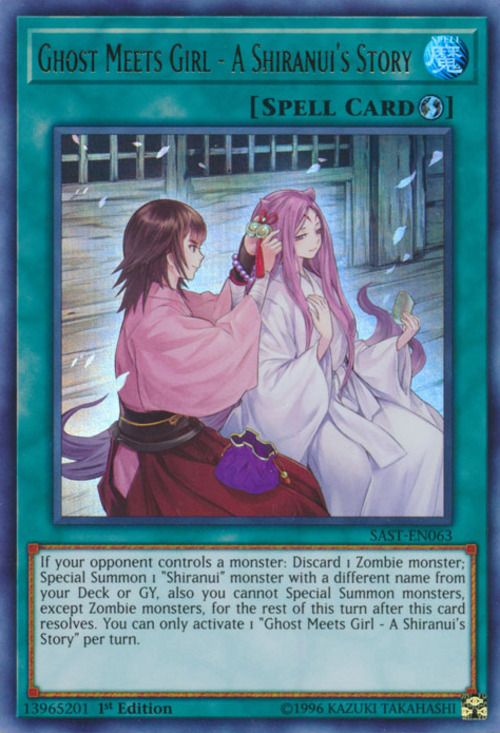 If your opponent controls a monster: Discard 1 Zombie monster; Special Summon 1 “Shiranui” monster with a different name from your Deck or GY, also you cannot Special Summon monsters, except Zombie monsters for the rest of this turn after this card resolves. You can only activate 1 "Ghost Meets Girl - A Shiranui's Story" per turn. Shiranui Squire and Dakki, the Graceful Mayakashi appear in this card's artwork.